The terrible accident on Ben Hope on February 5 robbed Scotland of two of its finest climbers. The exact details will never be known, but it seems likely that Steve Perry and Andy Nisbet fell from the upper section of a new route on the West Face. The news has devastated the Scottish climbing community. I first ‘met’ Steve Perry on Facebook when I was cycling from Lands End to Shetland. I was doing it in a semi-adventurous style, wild camping along the way and never quite sure where I would end up each night. Steve offered helpful and practical advice, and when I enquired about his own experience, he explained that he had not done it on a bike but on foot. His inspiring 32-week journey included all the 3000ft summits in England, Wales and Scotland and made my own little adventure pale into insignificance. A few years later over the 2005-6 winter, Steve made a continuous winter round of the Munros on foot, an incredibly arduous undertaking and the only time this has ever been achieved. So it was no surprise that when Steve turned his attention to climbing, his strength, fitness, enthusiasm and determination immediately shone through. Steve first appeared on the scene in winter 2013 when he was living in the North Coast village of Bettyhill and persuaded Andy Nisbet to attempt an unclimbed icefall on Ben Hope with his wife Katie. The result was Hopefall (III) and the beginning of the modern development of winter climbing on Ben Hope. Later Steve moved south to Inverness, and in 2015 formed a strong partnership with Andy Nisbet. They roamed far and wide, climbing dozens of new routes all over the Cairngorms and Northern Highlands, often at a frantic pace. It is difficult to single out individual routes, but the 470m-long Tower Ridge Integral (V,6) on Ben Hope, and Steve’s forceful lead of Theory of Relativity (VII,9) on Lurcher’s Crag were clear highlights. This season, Steve and Andy added Shapeshifter, the first Grade VIII on Lurchers’s Crag in the company of Helen Rennard. Another notable coup was the first ascent of Easan Feidh (VI,6), a 100m frozen waterfall near Ben Klibreck with Sophie Grace Chappell. “The first time I met Steve was because I wistfully commented on Facebook that I’d never climbed Ardverikie Wall. Steve’s response—to a comment from someone he’d never even met—was, as always, completely open and completely direct: he just said “Well, let’s go and climb it then.” Next thing I knew, we did, one fabulous summer day in September 2015. Andy came too, and spent the day on a shunt, examining lines next to the Wall for the Guide he was writing at the time. Up we went, slowly (the slab was seepy that day), while Andy yo-yoed back and forth on his shunt, up and down, in and out of sight, waving to us occasionally and shouting inaudible encouragement and course corrections. Above all, there was Steve’s unending, boyish, infectious enthusiasm for the hills. Just like his main climbing partner Andy, Steve was utterly dedicated to finding wild and fabulous adventures in Scotland’s most astonishing and magical remote places. He always had a million and one plans and dreams on the go; and I too was in his plans and dreams for future adventures, just as he was in mine. He and Andy were actually planning to climb with me this week: I was next trip up after the Ben Hope climb that they never came back from. This entry was posted in Commentary and tagged Steve Perry. Bookmark the permalink. That’s an excellent tribute to Steve. Until the Scottish Winter Forum Facebook page message the other day saying Andy and Steve had died on Ben Hope I had never heard of Steve. From your account it seems he was a formidable person in the Scottish Winter Mountains and along with Andy is going to be sorely missed by the climbing world and all family and friends for both of them. 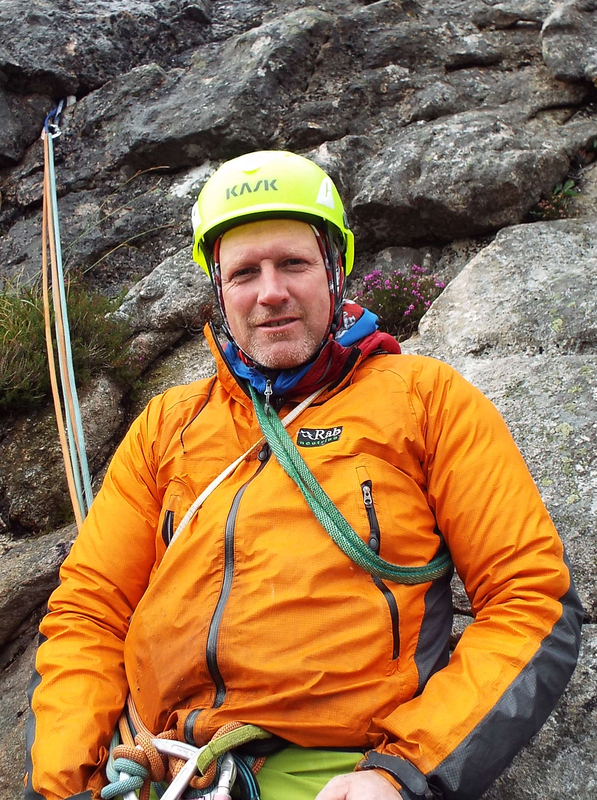 I only met Andy once and that was as a client on a Martin Moran Cuillin Ridge and Introductory Rock course in October 1994 when Andy was our instructor for the week. We never did the ridge as the conditions were too poor. But I clearly remember Andy taking us up the Cioch in dreadful wet and windy weather and belaying us up while he must have been so cold sat there exposed to the wind and rain. Later on the same week my other lasting memory was a day climbing on the crags at Shieldaig on a calm sunny day while the rest of Scotland was subject to a passing low pressure system. These two days were my first days rock climbing in Scotland and some of my first days ever and both made a lasting impression on me to this day. I wonder now if it had not been for Andy would I be climbing today. RIP Andy and Steve. I too, was devastated when I heard the news about the lads. Regularly, at the wall in Inverness, I’d watch his skilful handling of the routes on the wall, and how he helped his young daughter to follow his leads. I now will never be able to take Steve up on his offer to climb with him, so sad. I once remarked to him I’d not climbed any route at Kilt Rock. His reply, ‘that’s my favourite crag’. I so looked forward to him dragging me, now an ageing climber up, what I now know are terrific lines on the crag, after doing ‘Electric (something?’) what was supposed to be an easy HVS in the descent gully. The route, although great, is just what I liked in my good days, very strenuous crack climbing indeed. When I heard the news, so upsetting, I realised I had no photos of Steve on rock or ice, but I located one of my more memorable shots of Andy, his death, equally devastating to me. We used to talk a lot about local crags to Dores and Loch Ness, of slide copying to digital, and he would tell me, he holds the Club scanner for the SMC, but it was an outdated machine and needs skills to get Windows 10 working with it? (I bought a modern unit in the end and did all my slides very quickly). I was going to tell Andy of my progress, but now all I have is a stunning picture of he and I, clad throughout in winter snow, on a very bad day but fun occasion in the ‘Gorms. I’ll send you a copy, which might go well in the SMC? One a leader slips, with few or no runners, the jack-knife effect, as I personally know (on the Tour Ronde) is unforgiving, and immediately, I could see what would have happened on Ben Hope. I quickly now put that thought out of my mind. Your notes about these two great guys goes a little to towards helping us all understand the men, the motives and the subsequent accident, a little way, but it won’t bring them back.